There is no better time to visit one of the greatest European cities than December. With the festive celebrations in full swing, twinkly lights adorning every boutique lined street and mince pies being munched in abundance, London is the ultimate Christmas time travel destination. No trip to the British capital would be complete without partaking in the quintessential English tradition of afternoon tea. As you know, we’re what some would describe as advocates of the civilised afternoon tea. Café Royal sits proudly at the eastern end of the architectural masterpiece that is Regents Street in the heart of London. Arguably one of the finest luxury hotels in the capital, it’s a seamless blend of neighbouring Mayfair’s elegance, Soho’s energy and the sophistication of St. James. 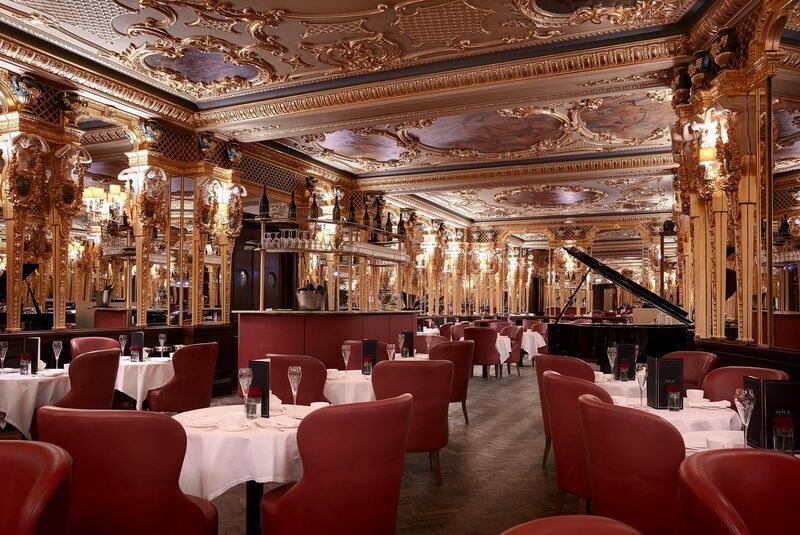 It’s history dates back to 1863, where a French wine merchant and his wife fled to London to escape bankruptcy and culminated in the creation of legend: Café Royal. The iconic Oscar Wilde Bar takes its name from its famous patron, but has also played host to the global elite: Mick Jagger, the Beatles and Elizabeth Taylor to name a few. It’s possibly the most beautiful, awe-inspiring room we have ever had the pleasure of stepping inside. Formally the iconic Grill Room, this exquisite salon has been perfectly restored to its authentic Louis XVI glory, proving that attention really is all in the detail. This is the Instagram worthy setting for Café Royal’s afternoon tea. As it’s the festive season, they are running a special Christmas version in collaboration with French Perfumer brand, Diptyque. Our. Absolute.favourite. As you enter you’re transported into a gilded world of beauty; this is the very space where great minds came together to change the world. We’re marvelled at the fact that this is the very room where Oscar Wilde fell in love with Lord Alfred Douglas, David Bowie retired Ziggy Stardust and some of the world’s most legendary personalities danced the night away. Its ethereal appeal exudes a feeling of nostalgic romance that it’s impossible not to come over all-starry eyed about. Practically skipping to the back of the mirrored room, we’re craning our necks in wonder as we stare breathlessly at the ornate ceiling. The soft, animated chatter of well-healed tourists and ‘ladies-who-lunch’ alike fill the room in harmony. There’s a live pianist softly playing in the background that tinkles in its festivity and we’re seated in a small leather booth with perfect people-watching potential. Swiftly, pressed white napkins are placed on laps and long, perfectly crafted menus are placed in manicured hands. The festive and modern twist on Café Royal’s award-winning afternoon tea, has been curated in line with the hotel’s philosophy of creating beautifully composed experiences. The experience manages to reflect Diptyque’s understated elegance rather than appear as a novelty (more expensive) version of what is already one of London’s best afternoon teas. Inspired by the brands most popular wintry scents, the tea has been transformed by Executive Pastry Chef, Sarah Barber, into a true indulgence for the senses. The ingredients in everything you taste; from sandwiches to the fancies, the palate cleanser to the varied selection of teas and blends, have been carefully curated to delight and tantalize the senses. A sprinkle of Christmas magic has been added and the menu of sandwiches, scones and fancies are accompanied by a choice of 30 blends and infusions. A glass of celebratory (it is the holiday season after all) Laurent-Perrier, Brut, N.V. swiftly replaces the menu and chinks echo throughout the cavernous room. All good afternoon teas should ideally, start with an amuse bouche. Complemented by happy sips of rose champagne, we tuck into the miniature Goat’s Cheese and Pickled Apple Muffin. An immaculately tiered stand takes centre stage on the circular table, laden with festive versions of the classic finger sandwich. From H.Formans smoked salmon with lemon crème fraiche to the most mouth-watering of Roast Norfolk bronze turkey with chestnut stuffing and cranberry ( it’s important to note here that the attentive staff will replenish upon request), each bite is a little bit of Christmas-y heaven. Of course, there is also the expected English Cucumber and Cream Cheese offering alongside the popular Egg Mayonnaise with Fresh Watercress. A close second to the roast turkey is the Roast Castle of Mey Beef with Creamed Horseradish. Also shamelessly replenished. Breaking from the bubbles, we opt for a varied selection of teas to accompany our afternoon delight. Elizabeth Taylor’s Earl Grey is highly recommended by both us and Oscar Wilde Bar itself. This superior blend comprises three single-estate black teas; two from India: a malty Assam from the Khongea Estate and an uplifting Nilgiri tea from the Craigmore Estate and another rich black tea from Hunan province in China. The blend is infused with bright citrus notes that come from an organic coldpressed Italian bergamot oil and resulting tea is deliciously smooth, silky and fragrant without being overpowering. There are many Exclusive Blends to choose from including the Lychee & Rose Noir for the more adventurous tea drinker. This fine Chinese black tea has been lifted by the natural fruit oil of lychee and fragrant notes of rose. It’s heady floral aroma combined with its creamy flavour is a true delight of the senses. There’s herbal infusions galore such as traditional chamomile which is perfect more summery than wintery in its taste, and the warming Ginger & Turmeric which has medicinal properties as well and is great for those who love a spicy tea to metaphorically curl up with. Fully immersed in the number of teapots that graced the table at any one time, we were startled when it was time for scones and the aptly titled ‘delicacies’ were discreetly placed in front of us, tableware changed and prepared for the next stage of the tea. Scones, with its impossibly English connotations simply make afternoon tea. Just the right number of warm scones lay in wait; traditional raison and plan scones sat pretty alongside clotted cream and colourful festive jam. With one eye on the sweet selection and the other on the scones, we remembered our manners and resisted the temptation to (quite literally) dive in head first. The ‘delicacies’ are so called because they are the most fragile, lovingly created pastries imaginable. Beautifully crafted Jasmine pistachio mousse is nestled between a dainty Vanilla and Caramel Victoria Sponge and a Raspberry Citrus Tart that is almost too pretty to eat. Almost. If you’re self-confessed chocolate lovers like us, then the Hazelnut and Chocolate Cream miniature desert will be the icing on the cake for you. Pun intended. After being wowed by the dazzling interior, charmed by the elegant atmosphere, and having grimly channelled gluttony by feasting on the gourmet wonders that have been served up, you’d be forgiven for thinking the experience was over. However, Café Royal in partnership with Diptyque, have one last surprise up their sleeves: a 70g Baies Diptyque candle to take away. We say surprise, you do actually pay a slight premium for the privilege but it’s worth it. Swishing out of Café Royal’s quaint revolving door into the real world outside, iconic monochrome gift bag in hand, you’re content in the knowledge that you’ve taken a little piece of the hotel’s illustrious style with you for the Baies scent is the most popular used throughout Hotel Café Royal; a combination of Bulgarian roses and blackcurrant leaves. Available until 3rd January 2018. Served daily in the Oscar Wilde Bar or the Domino Room.